PixArt: June Feature – Child Detection Agency! The portfolio of Boston artist Logan Faerber is full of surprises. On one end of the spectrum there is his design work – clean, iconic graphics and elegant typography. Then there’s his beautiful illustrations full of lively brush strokes and interesting color choices. They have a surprising energy and personality you don’t initially detect in his design work. It’s rare to find someone so skilled in both disciplines. Check out his portfolio – particularly his Dribbble account – and you’ll see the versatility of this talented artist. 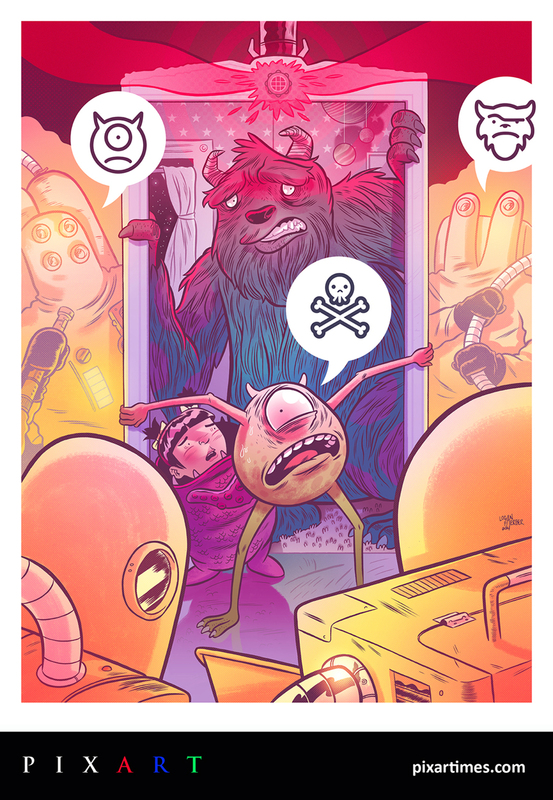 The Monsters, Inc. piece he’s created for us definitely shows off his lively illustration side but includes nods to his design work as well. It’s a perfect marriage of his styles and we’re so grateful for his time on this. Read on for more about Logan in his own words! The work of Katia Grifols is full of life. Her colorful character designs and conceptual pieces are visually dynamic and full of personality – just like the artist herself. From visual development art to character designs and comics, there’s lots to see and love on her various social media channels. We were excited when she agreed to contribute a piece to PixArt. 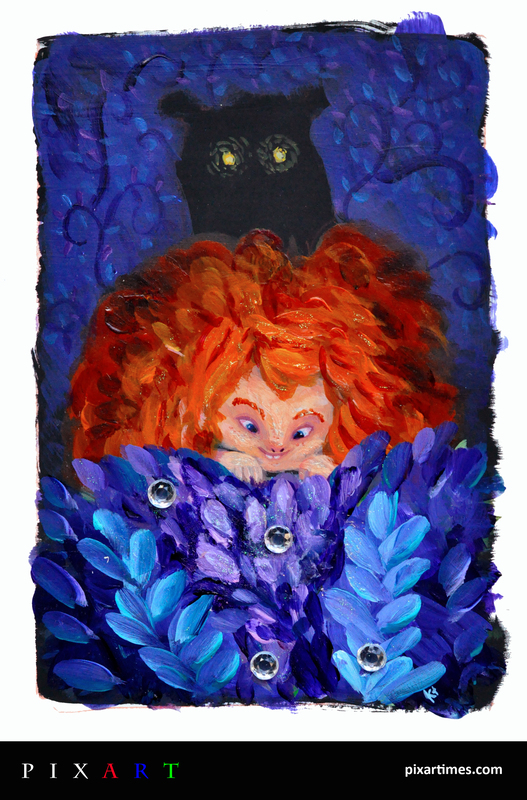 Check out her wonderful tribute to Merida from Brave. Read on for more about Katia in her own words and find out why she picked this fiery heroine as the subject of her painting! California based artist Dennis Salvatier produces some extremely charming and appealing art. His portfolio is filled with distinct takes on characters from pop culture. Combining a strong eye for design with some really appealing character designs, it’s easy to see why his work is so popular. Browse his portfolio to see the diverse set of skills he brings to his illustration, logos and design work. We thought he’d bring a great perspective to the world of Pixar and he certainly didn’t disappoint. 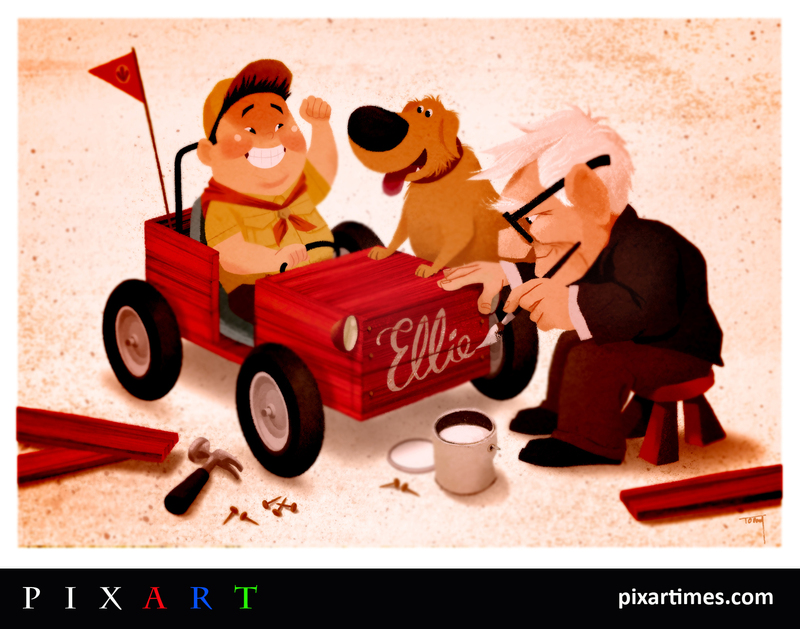 We’re thrilled with his adorable tribute to some of Pixar’s biggest films. Our thanks to Dennis for contributing this fantastic piece. Read on for more about Dennis in his own words. 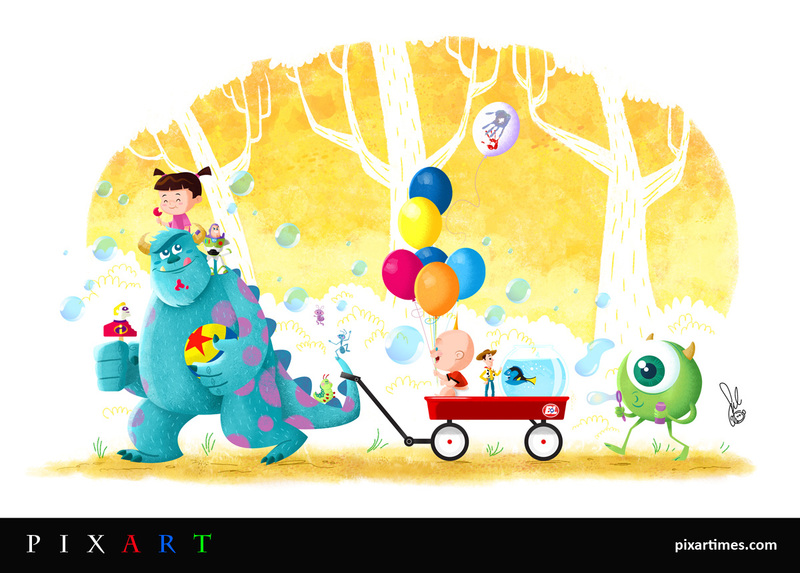 We are so excited to feature this new piece of art from Disney animator Benson Shum. Shum was hired at Disney to work on Wreck-It Ralph and then Frozen. He currently spends his time working on the upcoming Big Hero 6 (November 2014). When asked about getting started in the animation business, Shum said he knew he wanted to be an animator since his high school days. “I applied to Capilano College’s commercial animation program, but didn’t get in the first time. I ended up getting a job and worked on my drawings after work for a year. I applied again the following year and got in!”. In retrospect, Shum said he was glad he didn’t get in on his first try. “It made me appreciative and work harder when I got in the second time.” Read more about Shum and take a close look at his artwork after the break! There is an infectious and positive energy to the work of Colorado-based artist Luke Flowers. His style is distinct but versatile and full of personality. One look at the amazing images he’s created for us and you’ll see what I mean. 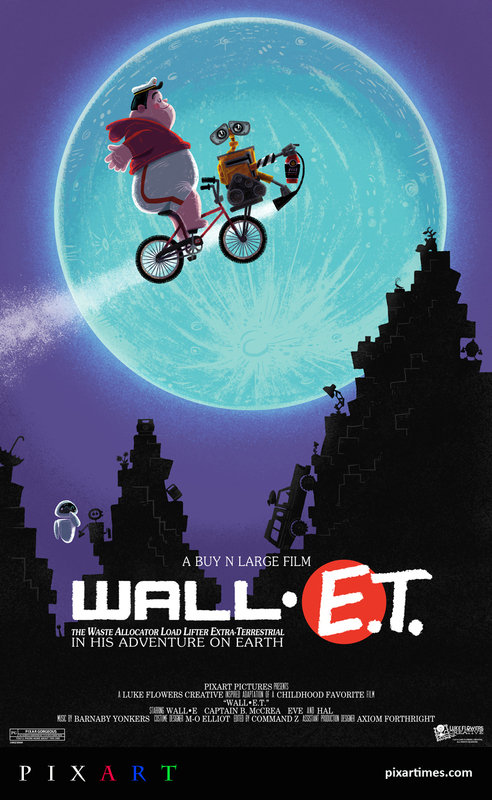 Mashing up Pixar characters with some iconic films of the 1980’s, Luke has created an homage to both segments while still maintaining his own signature style and charm. He really threw himself into this project and we couldn’t be more pleased with the outcome. A third poster was created for this series but, you’ll have to head on over to his site to see that one. It’s pretty great. While you’re there, you can get a closer look at this on-going project and see a little more detail about each poster he’s created so far. Our thanks to Luke for all of his time and effort on these wonderful images. Read on for more about Luke in his own words! This month’s PixArt feature comes to us from the super-talented California artist Jackie Williams. 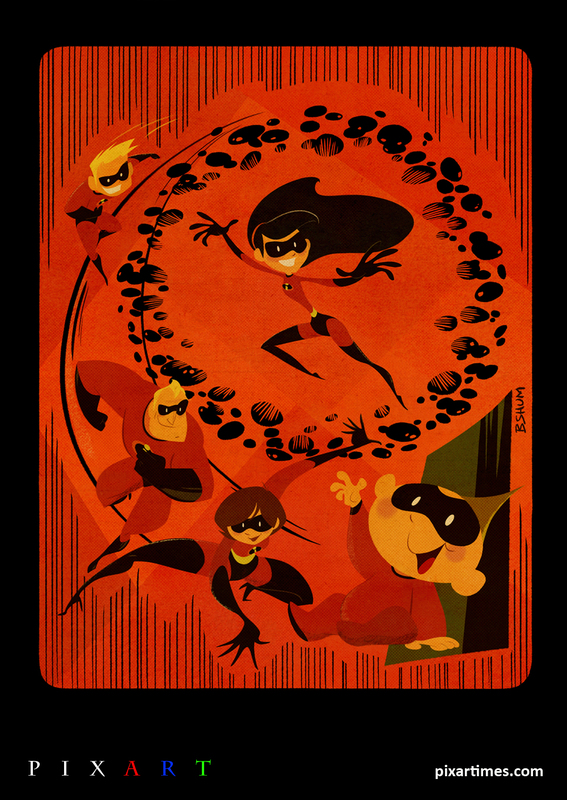 Jackie does some fantastic character-based illustrations and designs – many of which come from the world of pop-culture. 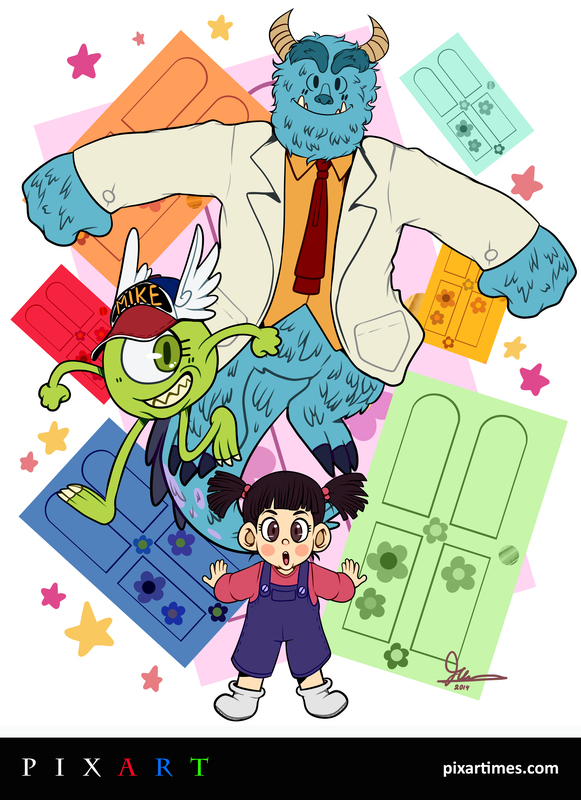 This monster of a mash-up finds Mike, Sulley and Boo as the characters from Akira Toriyama’s Dr. Slump. Like most of her work, it’s full of energy and personality. Make sure to check out Jackie’s websites to see more of her great work. Read on for more about her in her own words! Masses of color and restrained line work come together beautifully in the art of Greg Wright. The New Jersey-based illustrator creates some rather fantastic character designs and posters. He seamlessly combines illustration, design and text in some rather elegant compositions. Check out his site and tumblr for more examples of his expertly constructed creations. 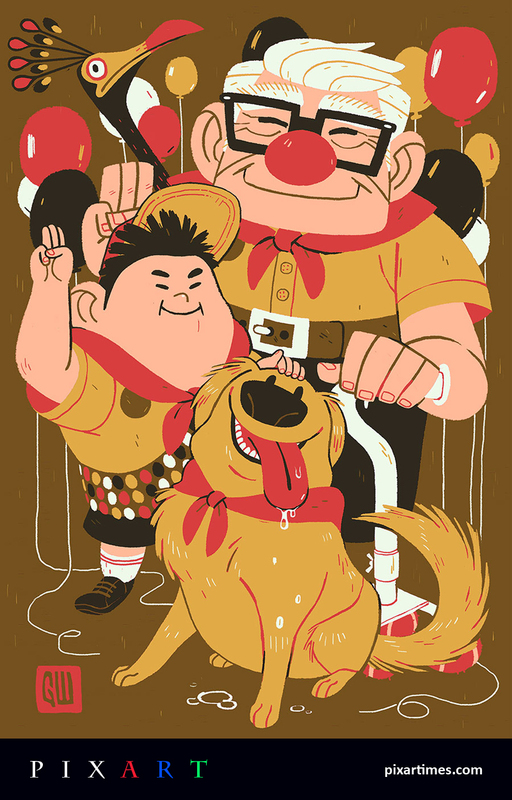 Our sincere thanks to Greg for taking the time to contribute this wonderful tribute to the characters from UP. We are thrilled to showcase his work on our site. Read on for more about Greg in his own words! 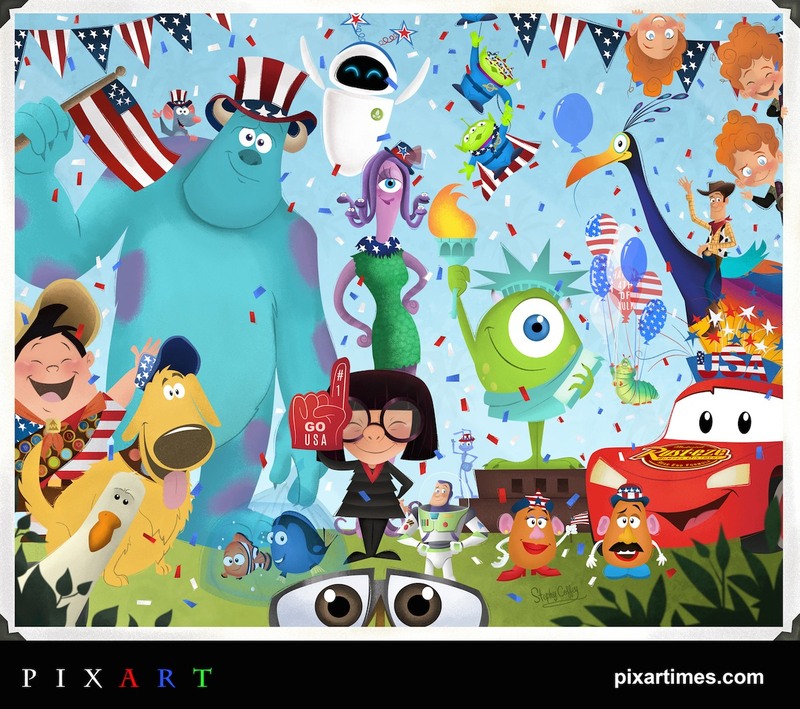 It is quite obvious that UK Artist Natalie Smith has a soft spot for the worlds and characters of Pixar and Disney. Take a look through her work and you’ll find tributes to Toy Story‘s Mr. Pricklepants, Monsters University (as featured in our Monsters Mash-Up Tribute earlier this year) and Mickey Mouse. She definitely brings a distinct style to her whimsical character designs and illustrations. Check them out for yourself at her website (currently under construction) and her dribbble account where you will see her passion extends to the worlds of superheroes as well. Continue reading to find out more about this talented artist in her own words!